"This moist vegetarian quiche is perfect for every meal. The quiche was originally a quiche Lorraine, but has since been transformed. Feel free to add sausage if you choose. I usually make 2 large pies or several small ones all at one time, freezing whatever is left over." Fit pie crust into a 9-inch pie dish. Whisk eggs, milk, parsley, garlic, salt, black pepper, and nutmeg in a bowl. Gently combine spinach, mushrooms, onion, and feta cheese in a separate bowl. Spread spinach-mushroom mixture in the prepared pie dish; top with half the Swiss cheese. Pour egg mixture evenly over the filling, swirling egg mixture in bowl to spread seasonings through the eggs; top the quiche with remaining Swiss cheese. Place quiche on a baking sheet. Bake in preheated oven until the quiche is lightly puffed and browned, 45 to 50 minutes. A toothpick inserted into the center of the filling should come out clean. Cool for 30 minutes before serving. 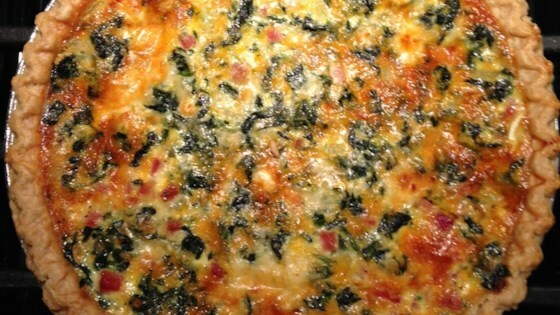 See how to make a tasty, reduced-fat spinach and Cheddar quiche. Only half of the vegetable/cheese ingredients fit into the pie shell, so the end results was poor. Would never make this recipe again.